When a business is deemed successful it’s often because of great people doing awesome things with the latest technologies. Yet there is always a built-in problem for long-time winners that follows their success over time – inevitable age that causes obsolescence of both people and machinery alike. The aging process leads to a need for ongoing retirement and refresh, even in companies that have in the past deployed prize-winning formulas. Unfortunately, winning arrangements by definition have survived, and through momentum often live well past their prime. When it comes to data protection, what worked very well in the past to help the long surviving IT and the well-established business protect their mission-critical data most likely no longer works quite as well as it did in its prime. In fact, given the pace of change in data, applications, architectures, and even the skills and expectations in the available workforce, most organizations are working feverishly just to keep their business applications competitive. Quite often long-running back-office disciplines like data protection have to limp along as best they can, maybe adding band-aids and patches where it visibly hurts but not actually refreshing the whole solution to keep it truly current. At least until something finally breaks in a big way – perhaps a ransom-ware attack, a rogue ex-employee, a 1000-year flood, or even full-blown compliance audit. By then of course it’s too late to be protected and prepared. The consequences can be fatal – winners can become losers overnight. Protecting legacy technology – Nothing that works well goes away fast. (Long live mainframes!) Even if users, usage, requirements, and expectations have grown and changed significantly over the years, the underlying IT methods, interface protocols, and performance capabilities of many long-successful applications and infrastructure may still be the same as the day they were first deployed – and today in 2018 that could be multiple decades past.Newer data protection architectures might require quite significant backwards integration to protect legacy technologies appropriately. And sometimes protecting both hardware and software built and deployed generations ago can still require legacy data protection technologies, doubling down on the legacy challenge. Technical legacies aging out – People grow old, especially experts it seems! Sometimes they leave even before they retire. Regardless, people inevitably grow old and age out of the workforce. And when they leave, there often aren’t equivalent knowledge replacements readily available. Old-timers just know things, particularly about legacy technologies, that no one newly available to the market will have any exposure or experience with.The learning curve for someone new to pick up legacy technology expertise may not only be steep, it may be too slippery to climb at all depending on just how legacy the technology really is. Lack of current documentation, relevant training classes, original equipment vendors, and of course senior staff mentors can all hinder effective knowledge replacement. Backup product stagnation – Many backup products have failed to evolve and keep pace with the current state of IT solutions. A partial laundry list would include virtualized servers, hyperconverged infrastructure, hybrid cloud applications, public cloud data pipelines, web applications, multi-cloud deployments, n-way replications, and globalized 7×24 operations. Let’s not even talk yet about protecting big data clusters, distributed containerized applications, temporal software defined storage, or IoT edge devices.In addition, expectations for data availability have changed significantly too – with end users more and more expecting “Apple Time Machine” like functionality in every IT application, instant RTO and seconds-level RPO from any mobile device anywhere in the world. Even if implemented backup solutions have somewhat evolved, the necessary patches, upgrades, and migrations are likely well outside the ability of many organizations to even consider rolling out. I’m sure top of mind for many is that if a complex, legacy solution is even partly working, it’s probably best not to mess with it at all or risk blowing it up completely. So what’s the best approach to dealing with age and obsolescence? Fundamentally it’s not fighting to retain aging staff on contract into their geriatric years, or ignore the increasing wrinkles and weakening bones of your data protection program. Rather it’s looking for a trusted service provider that specializes in data protection for enterprises like yours (like most, really). One that can afford to develop and maintain legacy technology expertise because they leverage it across multiple clients, that has current experience with most legacy hardware and software IT solutions, and that can not only maintain, but integrate, optimize and proactively operate modern data protection solutions for you on your behalf. If you have age-related issues with your data protection, and want to keep on as a winning corporation, you might want to ask an expert data protection company like Cobalt Iron to come in and show what they can do to help keep you eternally young. In IT there are well-known (and never 100% avoidable) risks that justify rock solid data protection – component failures, operator mistakes, application bugs, network outages and the like. Yet the business insurance plans we deploy in the form of data protection solutions are often incomplete, misaligned, offer poor capabilities (for management, assurance, recovery…), and sometimes can’t be trusted to work when needed. Businesses tend to push back most on the costs of data protection when they aren’t actually getting the protection they deserve (at any cost). First, IT needs to step up and solidify, actually verify, validate, and otherwise engender trust with the business that they’ve implemented the best (in terms of aligned, functioning, reliable, correct) protection solutions for the business. But a big second here is that “best” also means lowest cost. If budget were unlimited, IT could way overspend on “everything” and solve all the problems in the world. But realistically, IT needs to deliver rock-solid data protection coverage in the most cost-efficient manner. A fair question to ask right now is if it’s even possible to deliver a cost-effective data protection solution, given all the complexities enterprises can face (many of which were introduced in the last blog post on data protection complexity). We’ve seen that there are solutions that can get us there technically, but do they help corral cost? If not, we might find ourselves back at square one. Let’s look at two big ways that newer data protection solutions, those that meet our needs to handle enterprise scale and complexity, significantly lower total data protection costs (disregarding for the moment that new intelligent solutions also provide vastly superior coverage, reliability, and services than aging piece-part manual approaches). The first big cost-cut comes from eliminating wasted and obsolete spending outright. As a practicing analyst and long-time field consultant, I’d easily bet that anyone still running a toolbox full of “yesterday’s” data protection solutions has significant backup license misalignment. There will be unused or unneeded backup solution licenses lost or floating around even while key data is not being protected. According to Cobalt Iron, they’ve found that simply recovering stray licenses in some cases has provided a 20% cost reduction. Then by establishing cohesive backup management and centralized, automated control, whole aging suites of newly obsoleted software and hardware can be swept out the door. Some common legacy protection software, often purchased for narrow and now obsolete requirements, can be quite pricey even as their relevance and functionality have faded. The second big cost control comes from right-sizing the actually required solution. This aligns the data needs with software licensing, hardware, and/or cloud storage costs over time. Automation and elastic cloud services play a large role in this dynamic balancing act, but when implemented correctly it results in accurate, always minimized data protection costs in the face of ongoing business, application, user and technology changes. Operational time is freed up for staff that otherwise had to maintain currency in various aging technologies, manually oversee deployment and patching, directly tracking and attempting to manage widespread processing, and more. Cloud advantages in elasticity and dynamic provisioning can help optimize spending, but only when actively managed. Unmanaged cloud adoption is always going to become expensive as costs add up over time. This is really just the start of a full TCO reduction analysis that might also include quantifying data risks, business outages, staff shortfalls, and even new application provisioning agility (i.e. on-demand data protection services). The bottom line on the costs of data protection? It’s not a question of if you can afford it, rather it’s a question of what’s at stake when you don’t have “business complete” data protection. Knowing that there are now new solutions that can assure end-to-end coverage AND reduce total costs means that you should be moving to modernized data protection today! How do trends in primary storage affect secondary storage? I caught up with Steve Pao at Igneous recently to chat again about the rise of secondary storage. Primary storage is great and all, but flash is everywhere – it’s old news. In secondary storage, we are seeing a lot happening with scale and functionality and hybridization and built-in data protection services. 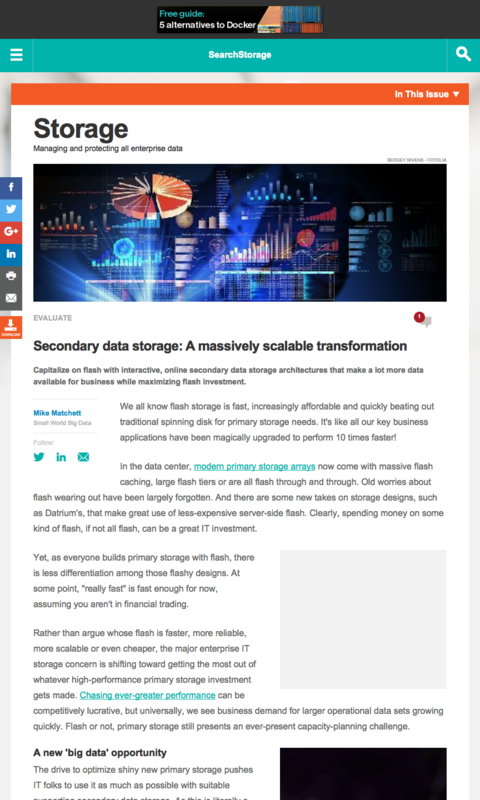 We all know flash storage is fast, increasingly affordable and quickly beating out traditional spinning disk for primary storage needs. It’s like all our key business applications have been magically upgraded to perform 10 times faster! In the data center, modern primary storage arrays now come with massive flash caching, large flash tiers or are all flash through and through. Old worries about flash wearing out have been largely forgotten. And there are some new takes on storage designs, such as Datrium’s, that make great use of less-expensive server-side flash. Clearly, spending money on some kind of flash, if not all flash, can be a great IT investment. Yet, as everyone builds primary storage with flash, there is less differentiation among those flashy designs. At some point, “really fast” is fast enough for now, assuming you aren’t in financial trading. Rather than argue whose flash is faster, more reliable, more scalable or even cheaper, the major enterprise IT storage concern is shifting toward getting the most out of whatever high-performance primary storage investment gets made. Chasing ever-greater performance can be competitively lucrative, but universally, we see business demand for larger operational data sets growing quickly. Flash or not, primary storage still presents an ever-present capacity-planning challenge. The drive to optimize shiny new primary storage pushes IT folks to use it as much as possible with suitable supporting secondary data storage. 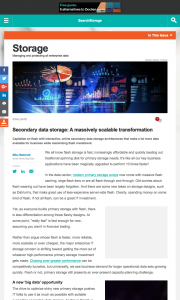 As this is literally a new “big data” opportunity, there is a correspondingly big change happening in the secondary storage market. Old-school backup storage designed solely as an offline data protection target doesn’t provide the scale, speed and interactive storage services increasingly demanded by today’s self-service-oriented users. We’re seeing a massive trend toward interactive, online, secondary storage architectures. Instead of dumping backups, snapshots and archives into slow, near-online or essentially offline deep storage tiers, organizations are finding it’s worthwhile to keep large volumes of second-tier data in active use. With this shift to online secondary data storage, end users can quickly find and recover their own data like they do with Apple’s Time Machine on their Macs. And organizations can profitably mine and derive valuable insights from older, colder, larger data sets, such as big data analytics, machine learning and deep historical search.